Agile Management ? CSD Certification In Houston Houston?s economy has interests in energy, manufacturing, transportation and aeronautics, in addition to healthcare. Home to many Fortune 500 companies, this city is home to numerous international software and Information Technology companies. These enterprises bring in the demand for skilled professionals to develop the economic makeup of the city. CSD Certification in Houston can be identified as a boon fromKnowledgeHut. Enabling professionals to make the most of the theory and practical aspects of the CSD training in Houston, this course comes as a top choice for aspirants to speed up their career advancement plans. What is the course all about? CSD course in Houston discusses the basics of Agile and Scrum basics while guiding through the concept of Sprints. Scrum roles, ceremonies and Artifacts are also discussed. Examining the Test Driven Development (TDD), Acceptance Test Driven Development (ATDD) and Behaviour Driven Development (BDD), this course brings about the differences between these approaches as well. Alongside classroom exercises conducted on BDD, aspirants can make the most of the coaching about tools and languages like Gherkin, Fitnesse and Selenium. Certified Scrum Developer Training in Houston provides a comprehensive understanding of Agile Architecture and Design while coaching about SOLID design principles, Design Patterns and Anti-Patterns. Aspirants will be put through detailed exercises on SOLID design principles and study on collaboration. TDD, Unit Test Framework and refactoring of code are examined. Continuous Integration, build types and concepts of Continuous Testing, Inspection, Deployment and Feedback are also discussed teamed with a Code demo and exercises that come as part of the exhaustive course material. 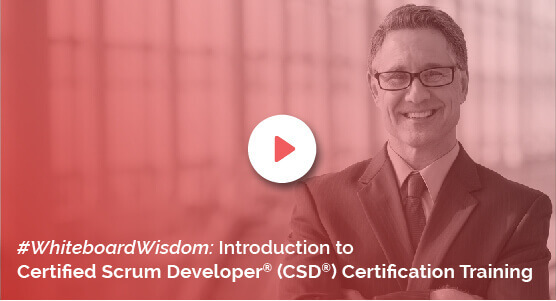 Benefits of the course: CSD Certification in Houston delivers an understanding of the Agile paradigm, helping participants to write extensible and efficient code within the ambit of Scrum. The course also throws light on implementing best practices and standards. The KnowledgeHut way: Scrum Alliance certified trainers conduct the Certified Scrum Developer Certification. In addition to 100 days of online access, the course offers a downloadable e-book also. The affordable cost of the course is inclusive of the exam fee.